Two years ago, congressional Republicans welcomed President Obama into the White House by stridently opposing his effort to rescue the plunging economy. At a time when businesses were laying off hundreds of thousands of workers per month, Republicans who had spent years in power racking up debt were unwilling to compromise on even a scaled-back stimulus bill. The American Recovery and Reinvestment Act garnered support from zero Republicans in the House and just three in the Senate. 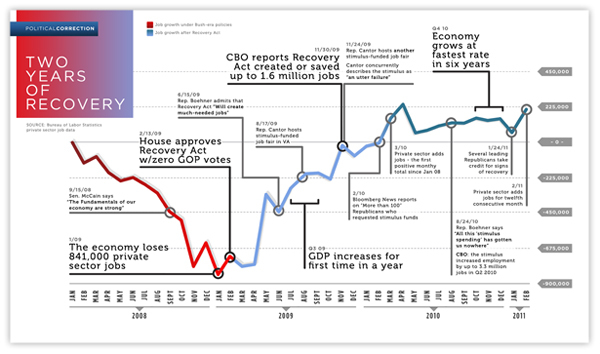 On February 17, 2009, Obama signed the Recovery Act into law, saying, "Today does not mark the end of our economic troubles. But it does mark the beginning of the end." 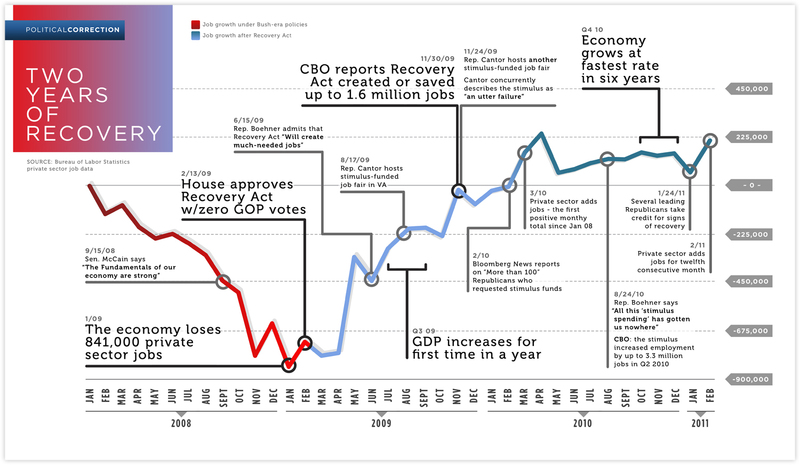 In the 24 months since, Republican politicians have simultaneously railed against the law, deriding it as a "failure" and denying that it created jobs, and taken credit for its success. Meanwhile, the devastating job losses that Obama inherited have turned into job gains: the economy added about 1.1 million jobs in 2010, more than the combined total of President Bush's eight years in office. 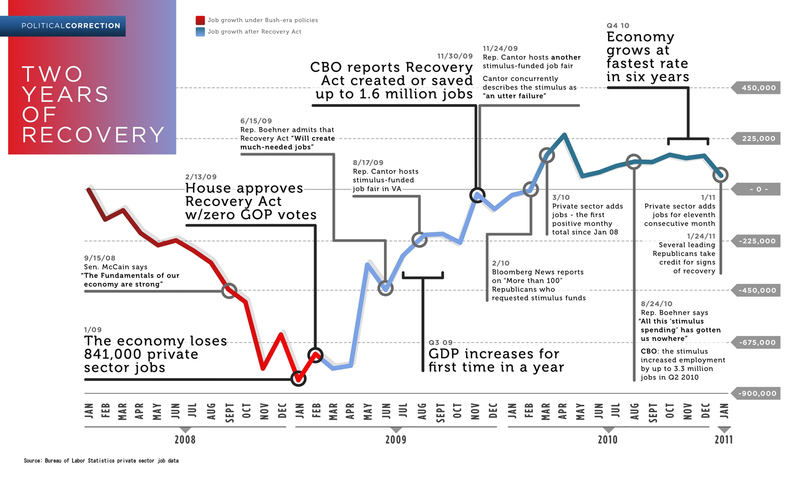 After cynically rooting against the recovery for two years, Republican lawmakers no longer ignore the signs of progress. Instead, they are shamelessly crediting their new House majority and Obama's bipartisan tax compromise for job creation and GDP growth that predated both. And after campaigning on an incessant chorus of "Where are the jobs?" Speaker John Boehner (R-OH) now says that if Republican policies cause job losses, "so be it." -- Graphic by Drew Gardner; Salvatore Colleluori and Julia Krieger contributed research to this post.